Five years ago, one friend wrote a few blog posts that have changed our lives. We had heard about child sponsorship at a few concerts we had been to, but had been a bit skeptical about if it really worked or not. Because God tugged at our heart strings, we began to make a difference in the life of one child. We only sponsored that one young lady for a few months. Soon after we started sponsoring her, her family moved away from the center she had been attending. Our friend encouraged us to select another child to sponsor. That is when we started sponsoring Lina, our 15 year old Colombian 'daughter' who I will be visiting next week! On my blog, on my Facebook page, on my Twitter account, and on my Instagram account, I share a lot about Compassion. Why? I believe in what they are doing to make an eternal impact for children, one by one. This morning, I read a story on the Compassion blog that reminds me why I love this ministry. Marlo is not a sponsored child. But because Compassion works through the local church, Marlo is not going to be left behind. This one young man will have one mentor to encourage him, pray for him, and be there for him to give him hope. The hope that can be found in that one relationship. 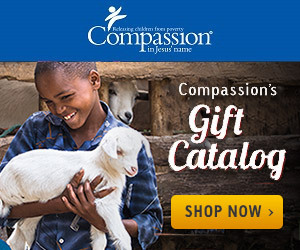 For $38 a month, you can sponsor a child through Compassion. For $38 a month, you can share the hope of Jesus with one child. For $38 a month, you can make an eternal impact for one child. I pray today, that you will make that one decision for one child.